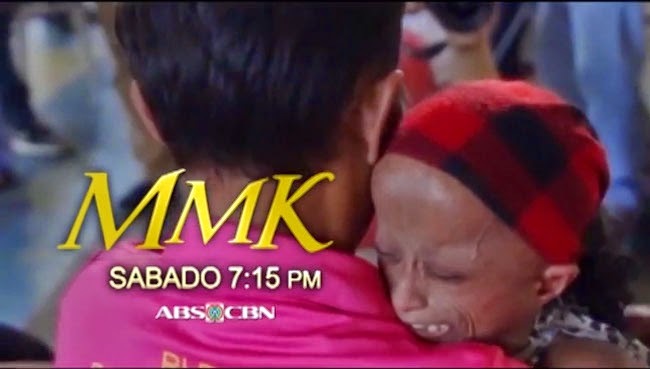 Xyriel Manabat portrays Rochelle a teenager diagnosed to only live until the age of 15 due to progeria in Kapamilya’s drama anthology, Maalaala Mo Kaya on Saturday, December 20, 2014. Rochelle, despite having the rare disease of aging fast, is still able to keep a positive outlook in life, to which Manabat had to reflect to the viewers. Rochelle was diagnosed of progeria when she was 5 years old. The rare genetic disease makes her age way faster than usual giving her wrinkled skin and and other signs of aging. The episode also shows her courage to live a normal life and have friendships and maybe a spark of romance despite her situation. According to Rosanna Pondare, Rochelle’s mother, the girl had been positive in life and loved singing. In a video clip of Kapamilya Thank You, her idol Sarah Geronimo visited her to inspire her and give her a gift for Christmas. Sarah and the rest of the kapamilya team had also beeninspired by her story leading to an MMK episode directed by Mae Cruz- Alviar. Joining Xyriel Manabat are Aiko Melendez, Paul Salas, Dang Cruz, Maggie Dela Riva, Crispin Pineda, Ian De Leon, Eva Darren, Paolo Angeles, Ishmael Claverio, Andrei Garcia, Carlo Lacana, and JM Ibañez. Xyriel Manabat is a kapuso child actress who had been known for portraying memorable characters in dramas such as 100 Days in Heaven and Hawak Kamay. Manabat had started her career in Star Circle Quest: Search for the Next Kiddie Idol and continues ;playing different roles in Kapamilya Network. For 23 years, MMK had been sharing inspirational stories of people and families around the world. This December 20, is another episode that will make hearts ache with a bittersweet story.